April 22 in 1970 marked the first Earth Day, which saw millions of people (mainly in America) pouring into the streets to bring environmental crises into the national dialogue. Over the past 50 years, Earth Day has grown into an international movement, engaging millions of individuals, organisations and spaces across the globe – including historical landmark and arts venue Somerset House in London, UK, which attracts over 3 million visitors every year. 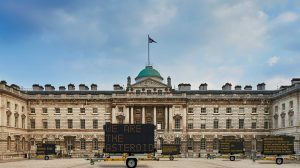 In 2017, Somerset House marked Earth Day through a collaboration with the artist John Gerrard. Gerrard created a large-scale public installation in the venue’s Edward J Safra Fountain Court: ‘Western Flag’ , a real-time simulation and representation of the “Lucas Gusher” in Texas – the first major oil find. In 2018, Somerset House expanded their Earth Day programming by running a series of different events exploring the future of life in the city and commissioning two installations on the theme of air pollution: ‘Pollution Pods’ created by the artist Michael Pinsky – a series of interlinked pods recreating the atmosphere of different cities, allowing visitors to viscerally experience the air quality of New Delhi, Sao Paolo, and more – and ‘Choropleth’ designed by the art collective THEUNSEEN – a flag flown from the top of Somerset House whose colours respond to air pollution. In 2019, Somerset House will be celebrating Earth Day Season, a fortnight exploring creative responses to to climate change running from 16th – 29th April. The American artist and activist Justin Brice Guariglia will be showcasing leading international voices on climate change in his installation REDUCE SPEED NOW!, a series of solar-powered LED signs in the public courtyard, and Hyphen-Labs have created an immersive underwater experience that will transport its visitors to a dystopian future. There will also be a range of events, such as a reading of new, unpublished poems by the Young Poet Laureate for London (2015-16), Selina Nwulu, and screenings and workshops. One of the individuals at the heart of Somerset’s House Earth Day programming is Karishma Rafferty, Curator of Public Realm and Partnerships at Somerset House and a Creative Climate Leadership alumni. After graduating from Kingston University with a BA in Graphic Design, Karishma Rafferty began her career as a graphic designer, working with institutions such as the Royal Society of Arts. In 2011 Karishma received her MA in Design Curating, and in 2013 joined Somerset House where she has worked on programming including the year-long Utopia 2016: A Year of Imagination and Possibility. Although Karishma has always been interested in social issues in her work, since attending Creative Climate Leadership in Wales in March 2017, the environment and climate change have become a more explicit specialism in her practice that she says in part stems from CCL. Karishma believes that art can give people the opportunity ‘to unpick and unpack’ social and environmental issues, opening up discussions around not just what people understand about the world, but also how they feel about their relationship to it. For Karishma, environmental art also highlights wider social issues. She reasons that environmentally focused arts and cultural expressions draw on the idea of being able to connect ‘super existential critical questions about how we live . . . to other kinds of intersectional ideas in society’. Environmental questions around, for example, plastic use are always interconnected with other issues such as age, race, money and gender; the social and environmental cannot be considered in isolation. For Karishma, one of the biggest impacts of CCL was rooted in the fact that it was ‘about relationships and conversations and creating a different tone for those, rather than necessarily “let’s learn all the science and preach to everyone else.”’ That emphasis helped her build, embrace, and articulate her own approach to creative climate leadership – which she sees as someone who can use the support networks and contacts they have to help address the global environmental challenges we face: addressing environmental challenges is as much about understanding the science at the heart of the issues as it is about bringing together networks of people to work together and support each other in tackling them. A few weeks after the course, for her CCL dissemination event, Karishma led an evening discussion with fellow team members at Somerset House in which they discussed the values, knowledge and skills that Karishma acquired on the CCL course. In mid-2017, Karishma was chosen to be part of an international talent development programme called Creative Producers International, run by the Watershed in Bristol and supported by Arts Council England’s Ambition for Excellence Programme, British Council and University of the West of England. Creative Producers International has supported the upcoming Earth Day Season at Somerset House. Sharing her experiences and expertise with other creative professionals, Karishma recently spoke at a Julie’s Bicycle Creative Green event at the V&A Museum about creative programming with environmental themes, and is an active member of the London-based What Next? Climate Change subgroup. In the future, Karishma hopes to continue this work and see environmentally focused projects and events continue to grow in ambition and scope at Somerset House. Alongside her work with Earth Day Season, she is currently thinking about how ideas of sustainability can extend into the broader Somerset House community and the wider ways in which we live. She is actively involved in the Somerset House Sustain group, which was set up as a forum for the over 2,500+ residents of the Somerset House community across arts and creative businesses, artists resident in the studios, start-ups in the co-working spaces, and others to meet, discuss, and support sustainability initiatives around the site. Karishma is also involved in consultations to create a new public pedestrianised space on the Strand Aldwych just North of Somerset House and King’s College London (next door). As part of this, Karishma is thinking about, writing on, and running workshops around ‘what it means to have a sustainable or environmental themed public space in the centre of the city, how to connect academia and culture together, and what that might mean for the future of London’ – in summary, how environmental sustainability can become ever more embedded into our everyday spaces and practices and how arts might interact with and help shape sustainable urban planning. To find out more about the upcoming Earth Day events, which will commence on the 16 April 2019 at Somerset House, follow this link.